Sometime around 1978 I walked into the Putney Street Pub at Wilmot and Broadway in Tucson, Arizona. I don't remember the name of the band that was performing, but it was a contemporary bluegrass band similar to The New Grass Revival. That was my first encounter with bluegrass music, and the 5 string banjo. I was mesmerized by the banjo picker. I started buying bluegrass albums by the hand full. There was something captivating about that 5 stringed instrument. It wasn't long before I started thinking about purchasing a banjo and learning how to play it. After all, it had strings like a guitar, and a neck similar to a guitar, .....couldn't be all that difficult to play. I was a fingerstyle guitarist, buy an Earl Scruggs banjo book and I should have the thing down in a couple of weeks. Yea, right! Boy, was I in for a rude awakening. The right hand technique was totally different than guitar. To play tunes, you used multiple tunings. (At that time I wasn't using open tunings on the guitar.) Not to mention, the beast itself was more like a machine than a guitar. It was a true struggle at first. not only for me, but my poor wife as well. There were a few times that I thought she was going to shove that machine in a place where the sun don't shine. I stuck with it though. By the time we moved from Arizona to California in 1980 I could knock a tune or two out of that thing. 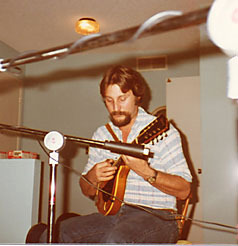 In early 1981 I hooked up with mandolin player Pete Lauderbach and we formed a bluegrass band. We performed together through 1985. 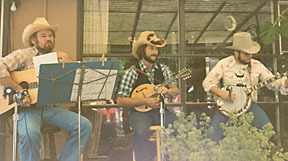 Pete also performed with me on guitarist during the years I competed in banjo competition. He was also featured on my 2002 album, The Gael. Over those years we never recorded an album, but we had collected quite a bit of music on cassette tape. Recently, I transferred some of the music from tape onto my digital studio recorder. I thought I'd post some of the tunes on my web site it hopes that you might enjoy the music. Jerry Ashford and I were raised in Los Gatos, California. We became friends somewhere around the 8th or 9th grade. Back in those days, Jerry had a reputation for being one of the best guitarists around. (He still does) It wasn't hype, he was incredible both as a flat picker and fingerstylist. We started pickin' together as a duet and in a band. That lasted until I moved to Tucson in the summer of 1966. Jerry was, without a doubt, the most influential individual in the evolution of my playing of the guitar. To this day we remain close friends. In 1983 I drove up to Bear Creek, CA to visit Jerry. I took my banjo. It had been 12 years since we had last picked together. 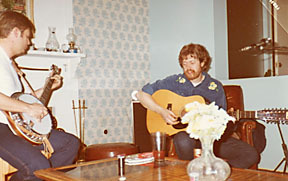 We had never played bluegrass together, and in as much as I had only been pickin' the banjo for around 5 years, we had never done a banjo/guitar duet together. Blackberry Blossom represents the first tune we played together in 12 years. We played it twice, as I forgot to turn on the "ghetto blaster" and record it the first time through. I should mention that I had driven all night and we started this jam session around 7 am, .....coffee followed with a cold beer. This is a rehearsal tape from 1985. 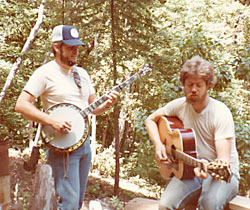 Pete Lauderbach (on rhythm guitar) and I were preparing for a Banjo competition. The tune is "Nickoli", and yes, I was using 4 Scruggs/Keith tuners.